Alphynho walks along a dirt path back to his house. He always has music playing on his phone in his pocket and sings a dances wherever he goes. Alphynho talks with his nephew Thabiso while he holds his guitar. Alphynho says he feels like a mentor and role model for his young cousins and other children in the community and they all look up to him. Alphynho irons some hand-painted curtains in his room while on the phone with his girlfriend, who attends tertiary school in Ghanzi, a town about 40 kilometers south of D’kar. Alphynho dances with his friends while they play the guitar. All of his friends are also very musically inclined and he says he gets a lot of inspiration from them. Alphynho hugs his new guitar. Alphynho prepares to record a new song during a recording session in Ghanzi. 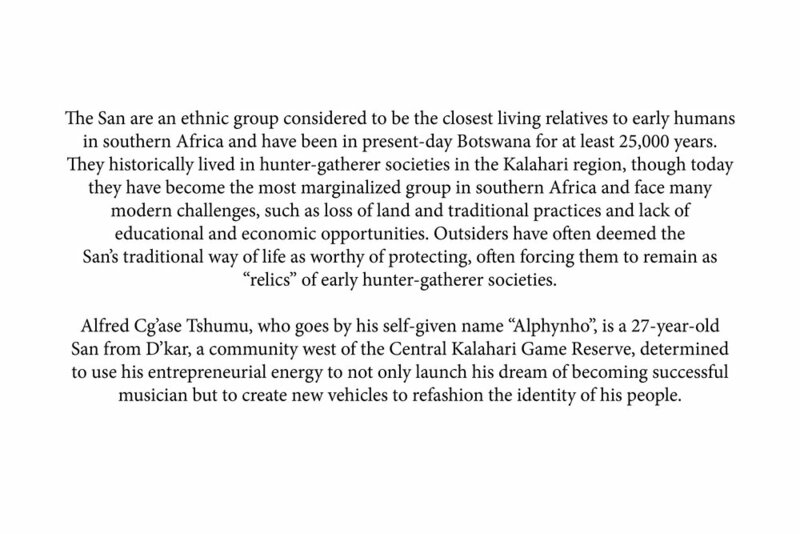 He sings in Naro, the native language of the San in the region west of the Kalahari, and uses many traditional musical elements. He hopes to preserve and celebrate his culture and language through his music. 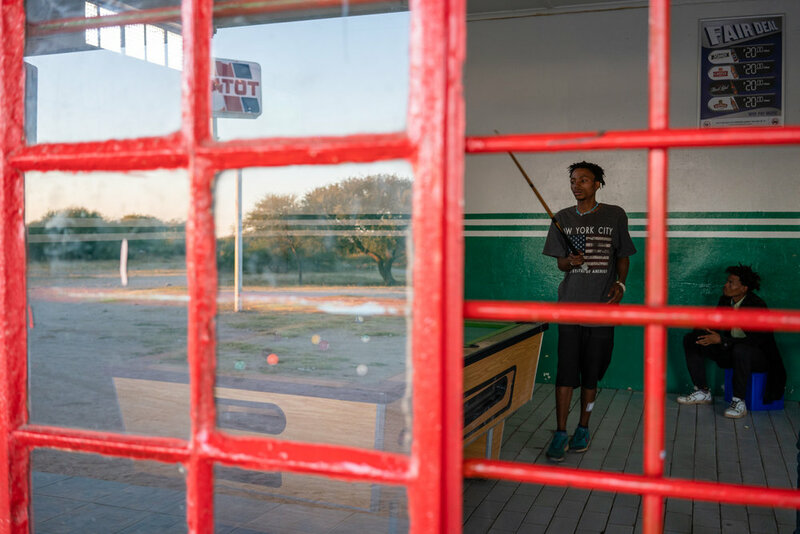 Alphynho plays a game of pool inside the only bar in D’kar, about a 15 minute walk from the center of the community along a gravel road. Toilets outside of the only bar in D’kar as the sun sets. Alphynho gets his hair plated my his girlfriend’s sister, Nqokga, whom he refers to as his sister-in-law. He prefers to have his hair done by family rather than going to a barber shop. Alphynho eats some berries while on a bush walk with his girlfriend and her nieces and nephews. 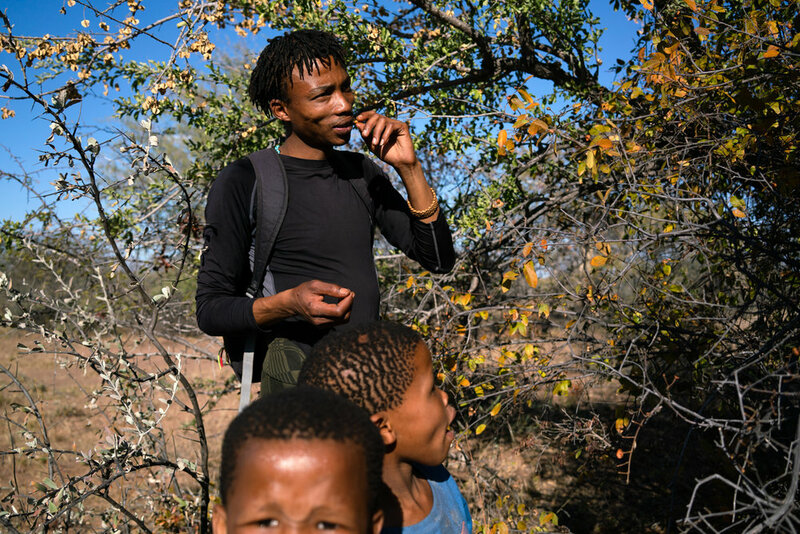 Gathering berries is a tradition for the San, but many young people reject this practice. Alphynho performs a traditional dance around the fire for international visitors attending a design summit in D’kar in July 2018. 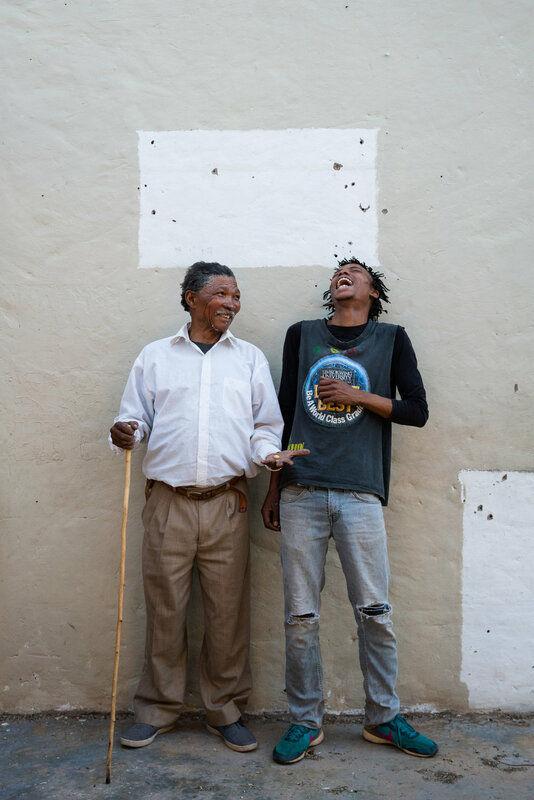 Alphynho with his grandfather Xgaiga inside of an abandoned house he recently acquired. Xgaiga intends to fix the house and property with Alphynho and turn it into a lodge. Portrait of Alphynho at dusk.